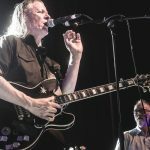 Swans farewell gig at the O2 Ritz in Manchester was a quasi-religious experience and Getintothis’ Rick Leach thinks we won’t see their like again. Highway with Harry Seacombe. Songs of Praise on BBC1. This is how it was thirty three years ago. Highway and Harry Seacombe are long gone; Songs of Praise is still hanging on. As are Swans. Just. Thirty three years ago they were on their starting blocks, beginning a sonic journey like no other, beginning with the still incredibly unique Filth album, a visceral assault on not only our ear drums, but on all our preconceptions about what music is all about and what music is for. What it means and what it can do. Using words such as intense and challenging with regard to Swans always seem to be a tad clichéd and tame. Unsettling and uncomfortable seem to fit the bill more. That’s the way they’ve carried on over the past quarter of a century and more. 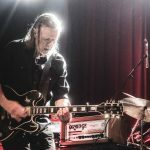 Great slabs of music, monolithic tablets seemingly wrested and dragged from the depths by Michael Gira and his conspirators in the band. 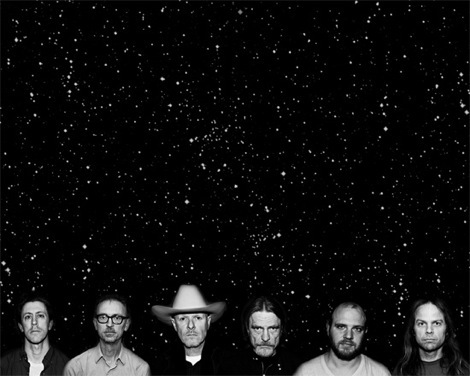 Lately, and since 2010’s My Father Will Guide Me Up a Rope to the Sky to this year’s The Glowing Man, Swans have produced a body of work which retains the early threats and inherent tension of Filth, Cop and Holy Money and added something more, something almost spiritual. Gira has said that this change was a matter of evolution and an organic process. Something that seemed destined and which would have happened in any event. 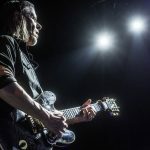 And like all evolutionary processes which reach a natural conclusion, Gira has just announced that Swans will be no more; at least in their current format. Something very different is on the horizon but neither us nor Gira really knows what it is. But for now, with The Glowing Man completed and a farewell tour wrapping things up, it’s time to say goodbye. 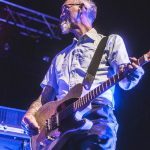 So with a certain sadness in our hearts (and earplugs in our pockets), Getintothis headed off to Manchester on a Sunday evening to see what Gira and the boys would throw at us. Would it be a tearful ending, with nary a dry eye in the house, lumps in the throat stuff, hardened Swans fans reduced to quivering wrecks of regret and sadness or would it be a celebration of what was ending and an optimistic look to the future? Whatever it was, it was going to be our songs of praise. Opening for Swans was Sweden’s Anna von Hausswolf. Her 2015 album, The Miraculous, full of Swedish tales of mystery, magic and terror, and making full use of the colossal sounds of a massive and ancient pipe organ containing 9,000(!) pipes was rightly acclaimed as an album of the year. It was going to be interesting to see how she could replicate even half of that sound with what is an incomparably soaring voice on the album in a live setting. Especially when that live setting was that of the 02 Ritz on a Sunday night. We weren’t disappointed. Anna von Hausswolf’s dark Nordic songs, doom-ridden and gloomy beyond belief, translated well from Sweden to Manchester. There seemed to be a sense of the ancient about it all, as if she is simply dredging up from the very bowels of the earth songs that have been around for aeons. She presented something to us that was already there yet we just didn’t know how to take hold of it. She was not just a support act there to make up the numbers; there was something extremely appropriate about her opening for Swans. She was like John the Baptist preparing the way for what was to come. It was a perfect fit. Swans have now reached that entirely professional stage; completely disciplined and with no messing around. They were billed to start at 8.30 pm and you could have set your watch to them. By now we shouldn’t expect anything less from them. This is the way they operate. No show business affectations. If they tell us they’ll start at half eight, that’s when they will, because for Swans this is a job and a job that has to be done properly. Half eight on the button, Michael Gira and the boys kicked things off. And how! A drone. A low hum. Warm and comforting, like being wrapped up in a giant blanket on a cold night. 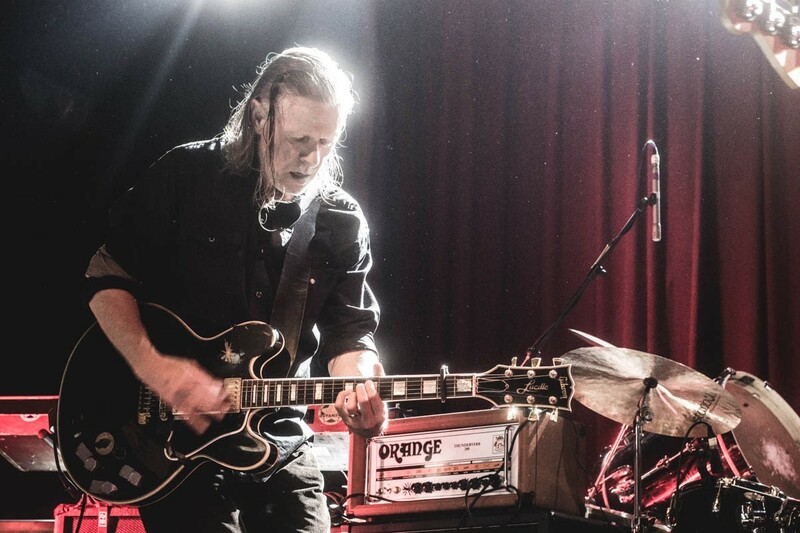 It’s odd to think of Swans music being comforting, but that’s how it was. It kind of makes you feel secure. We knew that uncomfortable music was on the way, that was bound to happen, but for the first twenty minutes or so that certain familiarity and purposefulness bound all of us there in a commonality lasted for the next couple of hours or so. We were all there, us and Swans, for one thing only and that was because we knew. Yes, it got louder and louder. Of course it would. This was Swans after all and loudness is what they are about. 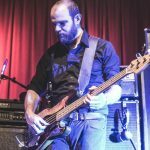 And yet, sheer volume is irrelevant if it’s not harnessed properly and in Michael Gira they have a conductor par excellence, someone who knows exactly what he is doing, as do the rest of the band. 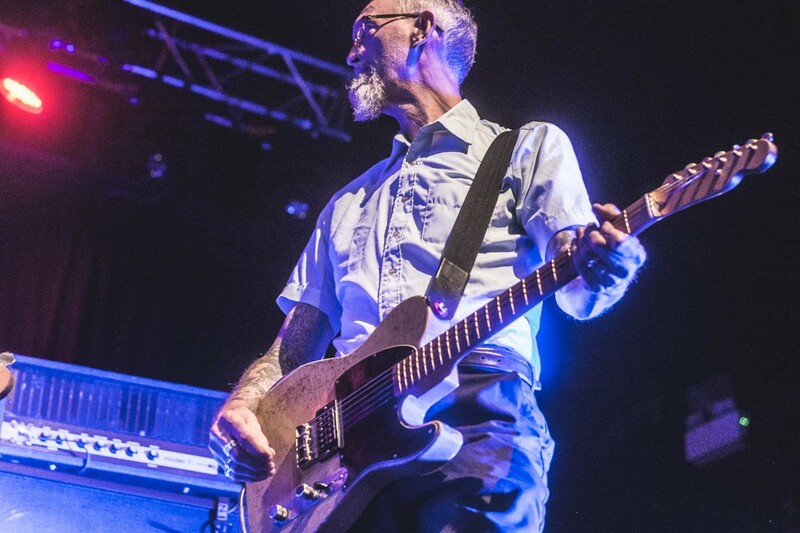 Norman Westburg, lead guitarist and longest serving member of this version of Swans now resembles a cross between an old-time gold prospector and an academic from some mid-West university involved in deep academic research. Christoph Hahn on pedal steel guitar, wrings sounds out of his instrument that you would not think possible and Paul Wallfisch, stepping in for Thor Harris on this tour, looks like a chess grandmaster who has found a skill with keyboards that makes him the Bobby Fisher of the band. 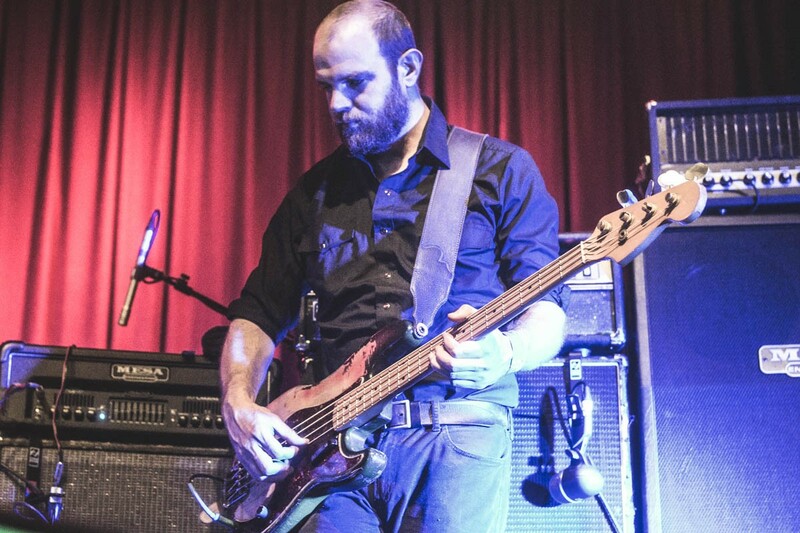 As for Phil Puleo on drums, well, it’s just a blur of tightly wound almost free-jazz expressions and it’s all underpinned with a funk-like bass from Christopher Pravdica. All these elements fit together so well now that they hardly need any direction from Gira. It’s all pulled together with imperceptible nods. 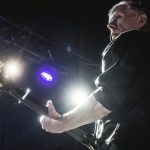 There’s a knowingness within this band that recalls the best groups you’ve ever seen, such as The Fall in the early 1980s, where words aren’t really required. 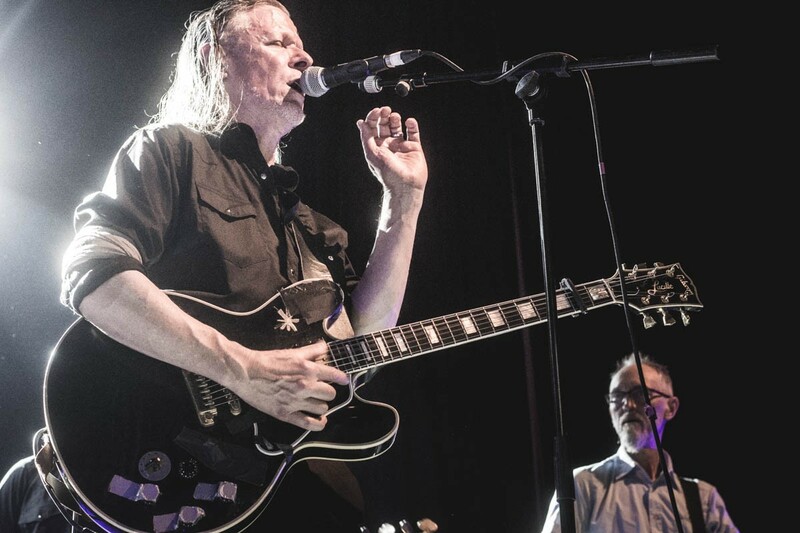 There’s a vision there that Swans attain again and again throughout the two hours and what’s staggering is that at no point does it become ragged or loose. The whole performance is akin to Prince live in his prime; there’s not a single note out of place and despite the sheer noise of it all, there’s a calmness underneath, a gentle stillness that flows below the sheets of sound. They largely concentrated upon the last two albums. Screen Shot from To Be Kind was a particular highlight, if any one track could be singled out, yet it seems unfair to pick just one. Cloud of Unknowing from The Glowing Man went on for ages and ages. Ten minutes, twenty minutes, thirty minutes? It was hard to tell. It just didn’t go on long enough. We were lost in that one song. Mesmerised by it. Nothing existed before or after that song. Time had stopped. We didn’t know anything else besides Cloud of Unknowing; nothing else mattered. 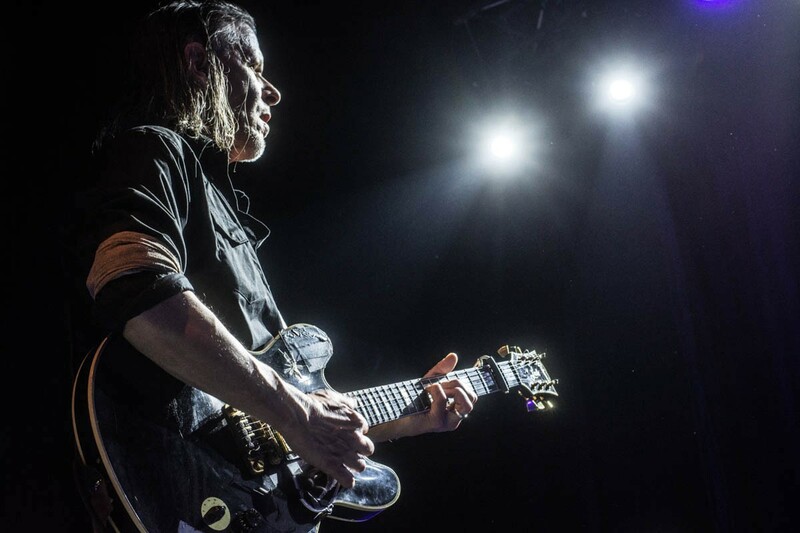 There was nothing outside of us, Swans and that music. 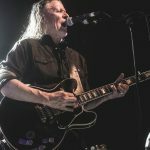 “I don’t really have an over-arching concept of what I’m doing” – Michael Gira on death, time and the future of Swans. The sadness of it all is that it had to end. All things do. One last song, one last blast of noise, one last powerful explosion and they were done. Like the dying of a star collapsing under its own mass or like Keyser Soze in The Usual Suspects, they were gone. So that was it for Swans. Like Harry Seacombe, we headed off down the highway – or at least down the M62 – with the lights of Manchester fading away in the distance and a ringing in our ears that clearly would take longer to disappear. 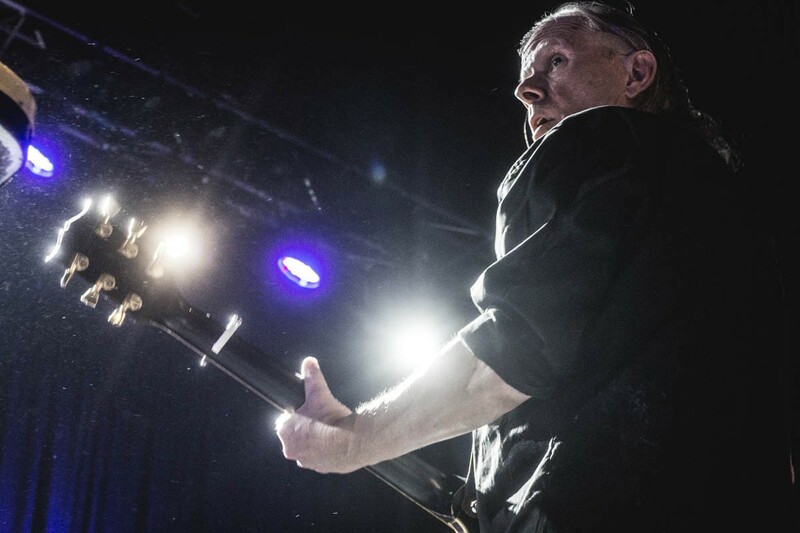 It had been a night of intensity like no other and an apt conclusion to this chapter of Swans. 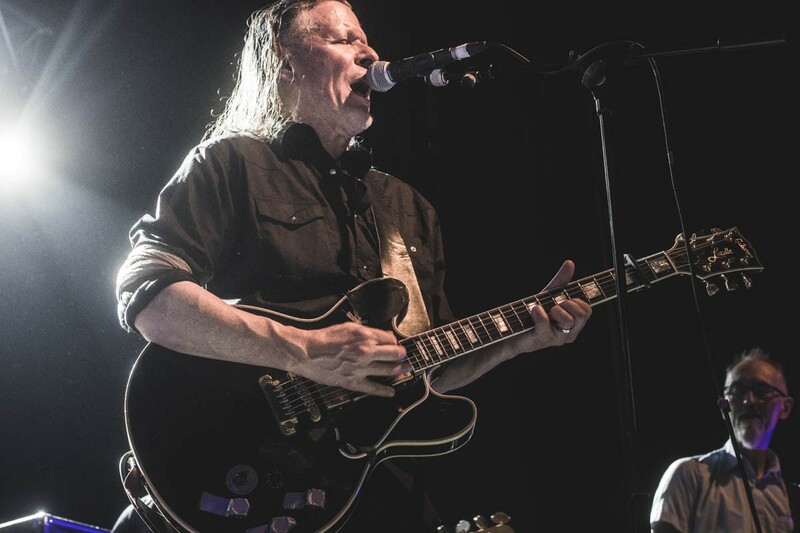 We can’t wait to see what Michael Gira comes up with next.